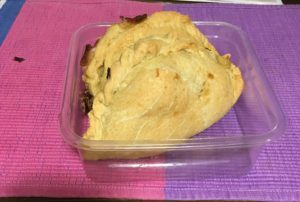 Description: This empanadas recipe is a labor of love and a perfect food to make on a relaxing day. The “beefy” style filling calls for many spices, and the spices and sauces are used to create a savory flavor. Some other great savory flavors that can be used include mushrooms and liquid smoke, so feel free to experiment with other spices and condiments. Last, there are two ways to seal the empanadas: the easier way, using just a fork, or a more technical version passed down from the author’s father by way of her abuelita. Mix all the dough ingredients in a large mixing bowl. If it is too thick, add some more water or a nondairy milk of your choice until it is slightly sticky and stretchy. Knead the dough until it is smooth, about 10 minutes. Let the dough rest in the fridge for at least ten minutes or longer. In a large pot, add dry lentils or textured vegetable protein, bouillon cube, soy sauce, vegan Worcestershire sauce (if using), BBQ sauce, adobo, harissa, all the dried spices and water. Bring to a boil, then lower heat and simmer until lentils are cooked. Once lentils are cooked, fold in corn, olives, and the reserved olive juice. Cut the onion in half and separate into individual layers. Cut the potatoes into large pieces. Do not dice the potatoes or the onions as they will later be removed from the water. Add the onions and potatoes into a large pot and cover with water. Bring water to a boil and cook until tender. Strain onions and potatoes from the water and add to blender. Strain the soaking cashews and add cashews to blender. Add enough nondairy milk until the onions, potatoes, and cashew mixture are half covered. Add the adobo and nutritional yeast. Blend on high (or on the liquefy setting) for 2 minutes until cashews are well blended and the mixture is creamy in texture. Set aside tomatoes and basil until forming the empanadas. Divide the dough into small handful-size sections. Knead each section until the dough comes together and is smooth. Using a rolling pin, roll dough until a half centimeter in thickness. Cut into 6-inch circles using the diameter (or lip) of bowl as a guide. Add three heaping tablespoons of the “beefy” filling. 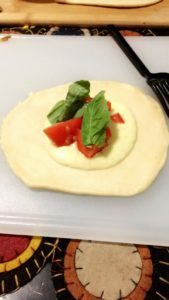 For the Caprese empanadas, add three tablespoons of the cheesy filling, 1½ basil leaves, and 1 tablespoon of the diced tomatoes. Brush your favorite nondairy milk around half of the perimeter. (Do not brush milk around entire perimeter as the empanadas will not stick together and seal close). 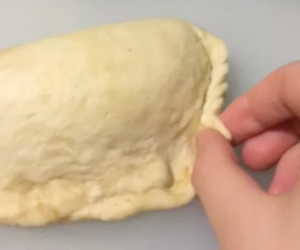 Fold the dough over the filling, creating a semicircle, pressing down to close the empanada. Using the tines of a fork seal the empanada by pressing down. Another alternative to sealing the empanadas: After using a fork to seal the empanadas, using your thumb, press down one corner of the empanada. Using your index finger, fold over the pressed down area. Press down the area of the folded piece (the part of the empanada furthest from the corner) and fold. Continue until the empanada is completely sealed. Poke the empanadas with a fork a couple of times. This ensures that the empanada will not explode while baking. You can also use this method to distinguish between the different empanada flavors. For example, three fork marks to distinguish the “beefy” empanadas and two fork marks for the Caprese empanadas. Bake at 400 F for 45-55 minutes, until the empanadas are slightly golden brown. Remove from the oven and serve warm. Enjoy with chimichurri sauce if you’d like. *Optional: No-egg wash – Brush melted vegan butter over each empanada.